What a difference a year makes. Last year at this time most of Ireland was covered in snow and ice. The country slipped and skidded and shivered through the coldest December in half a century. It was cold, but different. Kind of exciting. This December's been boringly normal. So far all we've had is the usual chilly, damp and, especially, windy weather that is typical of an Irish winter. This despite the fact that during the fall we had dire warnings of a repeat – more frigid weather was going to make a mess of our airports, roads and sidewalks. Getting around was going to be a chore again come winter time. The difference this year was that everyone was ready for another terrible blast of ice and snow. Local governments drew up action plans and bought in enough sand and salt to see them through a winter worse than last. Hats and gloves were in every store, supermarkets and hardware stores were urging us all to get our bags of salt and snow shovels to be ready for the onslaught of another vicious winter. Toy stores were ready with loads of sleds, hoping to convince kids to trade up from the plastic trays and politicians' signs that made do as sleds last December. So far the salt, shovels and sleds have been mostly left in storage. 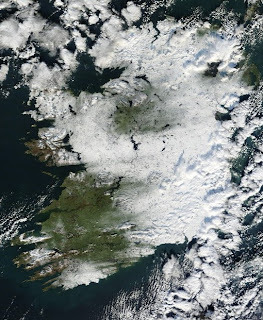 There has been some snow in the north and for a couple of hours last week excited Irish tweets were describing 1cm (0.4”) of snow on the ground across a large chunk of the midlands, but the #sneachta (Irish/Gaelic for snow) tweets petered out as quickly as the snow did. It was a desperate attempt to rekindle some of last year's magic. That's the funny thing. The snow was magical. Yes it was disastrous economically - the constantly closed airport kept exports home and tourists away, the impassable roads kept people from getting to work or the stores to shop - but the snow had a magical effect on last Christmas. As a lot of people found out when last year's snowy Christmas arrived, not being able to go anywhere actually made Christmas better, more relaxing. It's a sentiment I've heard a number of times the past few days. I suspect that there's more to it than just the bit about Christmas being more relaxing. A lot of people - adults as well as children - really liked the snow. Not just shirkers, happy to use the snow as an excuse not to turn up at work. The snow made for a nice change. Ireland looked fantastic last December. The beauty of the snow-covered Irish landscape, urban as well as rural, relieved the gloom caused by the country's money problems. Many Irish people would love to have the snow back this year, only with a functioning transport system and shoveled sidewalks so that old people wouldn't again be trapped at home for weeks. This December Ireland is dull and dark. What last year's snow hid that this year's weather cannot is that far fewer people are lighting up their houses with colored lights and Santas and snowmen and the like. Too expensive to buy or light up, I suppose. Some town centers are going without Christmas lighting this year due to teh cost. There are houses around us that used to be lit up like Times Square that are now pitch black. From some you can see the faint glow of a television coming through the blinds. From others not even that. This was true last year too, but the assumption - hope is probably better - was that the cold and the ice stopped people decorating outside. Now it can't be denied - the dismal economy has made our Christmas darker. We could use some natural decoration.